Some of the most popular concrete floor covering ideas are staining, polishing, stampable overlays and decorative epoxies. I can attest to this firsthand since I'm installing these types of floor finishes all the time for homeowners and businesses. On this project we stained the concrete, sealed and waxed the floor for a great looking finished floor. 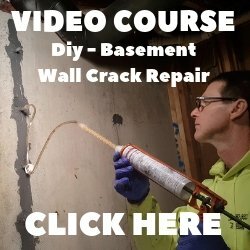 The condition of the concrete, especially the surface, is very important when considering these kinds of finishing techniques. Staining and polishing will show any repairs that have to be done to the concrete so it's important to protect the concrete during new construction with a product like Ram Board. Older floors in great shape are usually no problem for staining or polishing. If there is some pitting, chips or cracking, then a decorative epoxy or an overlay might be a better option. Here are some great ideas for using concrete as the floor finish. INTEGRALLY COLORED CONCRETE - Add color to the concrete during the mixing process by dropping powdered bags or liquid colorant directly into the concrete truck. There are many colors to choose from. 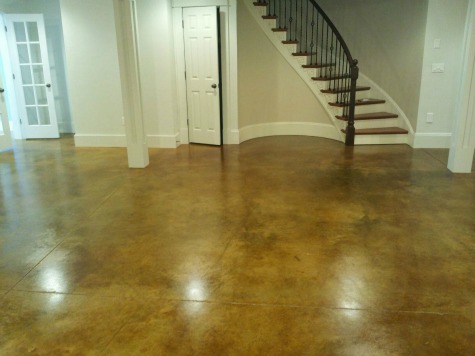 This is a simple and easy way to have a colored concrete floor as your finished product. SHAKE ON COLOR HARDENERS - These are finely ground, cementitious aggregates that are broadcast onto the freshly placed concrete surface. Moisture from the concrete absorbs into the powder, it is then floated in by hand or with a power trowel. There are many colors to choose from here also. This can be added to integral color to produce some very nice coloring effects. CONCRETE STAIN - Acid stains lightly etch and bond color into the concrete surface. They can be used on new and old concrete floor coverings. They create a mottled and translucent effect with rich tones that can mimic marble and granite. Concrete dye is another form of staining without the acid. The dyes offer much more vibrant colors and can be used with acid stains for some amazing looks. STAMPED CONCRETE - The freshly place concrete can be imprinted with rigid or flexible rubber concrete stamps. Stamped concrete patterns like stone, brick, tile, wood, slate and many more are available. The concrete is usually colored and/or stained to produce a concrete floor covering that looks just like the real thing. STAMPED CONCRETE OVERLAYS - These are thin concrete coatings, usually between 1/4 to 1/2 inch thick, designed to cover existing concrete floors, slabs, and wood floors. Their purpose is to provide a decorative textured surface similar to stone, tile, brick, wood and other natural materials. The overlay material can be tinted with color, acid stained, or dyed to add color to the flooring. MICROTOPPINGS AND SKIM COATS - These are ultra thin toppings, 1/8 thick or less, that can produce a very smooth, new canvas for applying concrete stains and dyes to create a stained concrete appearance. This is a very strong, durable, and abrasion resistant concrete floor covering. SELF-LEVELING CONCRETE OVERLAY - These are being used a lot more as the finished concrete flooring material. In the past self leveling concrete was used to repair uneven and worn concrete, then covered with another flooring material. Now it can correct damaged, uneven floors, and at the same time provide a smooth, durable surface that can be integrally colored, stained, or dyed. Self levelers usually go down between 1/4 to 1 inch thick. SPRAY DOWN OVERLAYS - This floor covering is used more on exterior concrete surfaces. They are great for pool decks, patios, and concrete driveways. They are thin like a microtopping, but provide great texture because of more sand in the mixture. High traffic areas would benefit from this coating as it is very durable. When used together with a stencil, all sorts of decorative effects can be created. I would definitely recommend concrete as a floor covering. With the many colors, patterns, and textures to choose from, these systems can be installed many different ways that is unique to you. A concrete floor covering, in most cases, is much less expensive than a comparable material. 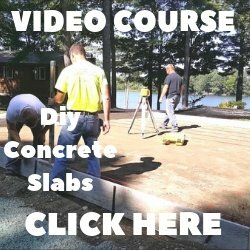 CONCRETE SURFACE PREPARATION is very important when applying any concrete overlay material.